The latest promotion from T-Mobile undercuts Verizon, AT&T, and Sprint by a wide margin. T-Mobile has a new promotion for both new and existing family subscribers, and it’s significantly cheaper than anything from the other major carriers. The new plans provide 10GB of 4G LTE data per line, starting at $100 per month for two lines. Subscribers can add a third line—also with 10GB of its own data—for $20 more per month. For those who sign up by Labor Day, T-Mobile is giving away a fourth line at no extra charge (though taxes and fees still apply). By comparison, Verizon charges $170 per month for two lines with 20GB of shared data, and AT&T charges $180 per month. For a plan with four lines and 40GB of shared data, Verizon and AT&T both charge $360 per month—three times the price of T-Mobile’s current promotion. Sprint comes a bit closer, at least new subscribers, with a current offer of five lines with 20GB of shared data for $100 per month. Normally, Sprint charges an additional $15 per line access fee, but is waiving that fee for new subscribers until September 2016. T-Mobile’s new plans will launch on July 15 for both new and current subscribers, and while they’re billed as limited-time offers, there’s no set expiration date. Subscribers will get the same benefits as other T-Mobile plans, including mobile hotspot use, rollover data, free overseas texting and data, and free roaming in Canada and Mexico. 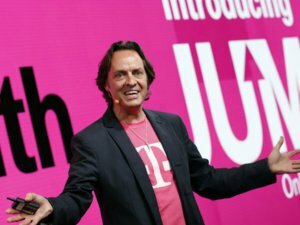 As with most other T-Mobile offerings, these plans don’t include the cost of a smartphone, which can be purchased in full or paid off in monthly installments. The impact on you at home: Keeping track of T-Mobile’s various promotions can sometimes be a confusing affair, especially when a new deal seems to be at odds with previous ones. But for people who expect to use a decent amount of data every month, this new promotion is an unambiguous bargain.